A few of the best mobile apps found on campuses across Canada. EssayJack: A digital essay-structuring tool, EssayJack assists students writing persuasive essays in the humanities and liberal arts. With a goal of reducing the stress and time associated with essay writing, the app provides tips and prompts to ensure the appropriate essay structure. Co-founded by Carleton University professor, Dr. Rueban Balasubramaniam and Dr. Lindy Ledohowski, a former tenure-track English professor at the University of Waterloo and current Board member of the Canadian Museum for Human Rights, it was developed in prototype in 2014 and tested at the University of Toronto. Its current, beta version was launched in September 2015 and is being tested in a number of contexts, in particular with students at both Carleton University and the University of Toronto (in addition to various high schools and tutoring centres). The app currently has around 500 users and five different pilot licenses. “EssayJack is built on the idea that form influences content. Using pedagogical frameworks of scaffolding, we have created an interactive web app that pre-structures essays, so that students can put the right things in the right places in the right way,” says Dr. Balasubramaniam. Unique features include a split-screen function that shows the essay draft developing in real time; auto-generated tips and prompts; and context-specific transitions that provide the logical connections between the various component parts of an essay’s argument. While EssayJack works best in liberal arts and humanities courses, the tool is very versatile and can be customized. 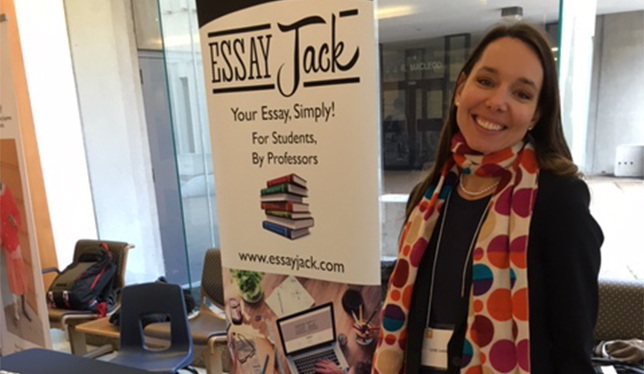 “Educators in a license context have the power to customize templates for their students – which allows EssayJack to work for various kinds of essays,” says Dr. Balasubramaniam. They hope to expand into other disciplines like business and law case analyses, and have had early conversations about offering the app in international schools like the National University of Singapore. 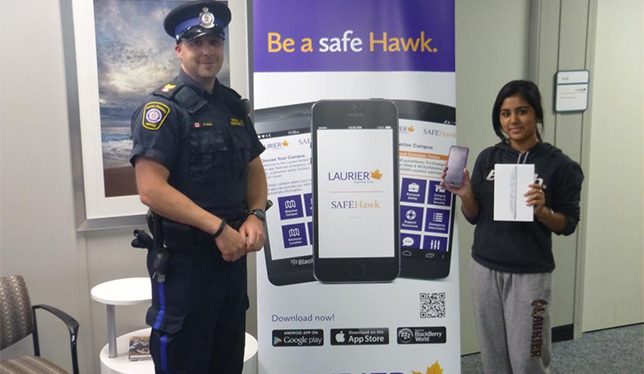 SAFEHawk: Tammy Lee, the associate director and head of campus police for Wilfrid Laurier, recognized the need for a customizable, convenient and two-way method of communication for the campus above and beyond the current mass communications system. The app (developed by AppArmor, which designs custom mobile security apps) is customized to Laurier and contains information specific to their campus policies and procedures which Lee says costs more, but is more effective and encourages more interaction. “Our school has basically been the poster child for this app,” says Lee. “We’ve had positive feedback all the way around, and we used it during a recent lockdown situation on campus where it worked very well and was a key component to getting important messages out across the campus.” It boasts a multi-campus structure and a Twitter feed for real-time notifications from the school and the local police; there’s also ways to notify campus police of any issues anonymously. “Most universities have some kind of mass communication systems, like email, but we needed something that was more immediate and engaging, with alerts and newsfeeds and places for students to voice their concerns. It’s more like community policing.” The team at Wilfrid Laurier is now working on making the app available in Mandarin, the most commonly spoken language among their international students. 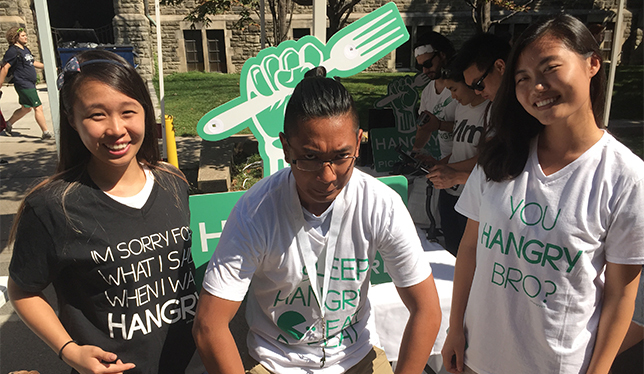 Hangry: This app allows users to locate, order and pay for food at any campus establishment, skipping long waits and the hassle of exchanging money. Co-founders Mark Scattolon and Fabian Raso, both from Hamilton, originally developed the concept to work with restaurant chains outside of the campus environment, but gained a new direction and a financial boost in their business after a successful turn on Dragon’s Den. The U of T St. George campus and University of Alberta have signed on and McMaster will be joining this month, with a couple more as yet unnamed campuses to join later in winter 2016. Since the launch at U of T in October 2015, orders are increasing at about 50 percent per week, and 69 percent of users are repeat customers. “We’re forecasting to be at fifteen to twenty of the top campuses by September 2016,” says Scattolon. Users can rate and review their food order and service, and this information is sent anonymously to the food service providers to improve their service. The app also saves order history for ease of use, and allows users to track the order status to ensure it’s always fresh and hot when they arrive. There is also a built-in loyalty program, where users can earn points they can redeem for free food and services: things like following Hangry on Facebook, uploading a selfie, and simply using the app will earn you loyalty points. They are also working on integrating the app with students’ pre-purchased meal plans. Ultimately, Hangry was borne from the partners’ understanding that the millennial student generation will pay for convenience. “At the end of the day, students can sit in class, place their food order, and when they get to the cafeteria their food is bagged and ready for them,” says Raso. How naive this all sounds. Neil Postman, an astute and sensible philosopher and expert on the effects of media and technology on true education (Technopoly: The Surrender of Culture to Technology) puts the lie to so much of this nonsense. In this particular book he analyzes how our increasing dependence upon technology, numerical quantification, and misappropriation of “Scientism” to all human affairs is destroying an entire generation. Are we digital dummies? You just have to read a few current university student essays to see how the information glut is ruining the ability to focus on problem solving knowledge–something that, if you don’t learn to do in your 20s you never develop later on.